Gary Teale feels he has done enough to secure the St Mirren manager's job beyond the summer, despite being relegated. The Saints came from behind to defeat Ross County 2-1 in Dingwall with Steven Thompson's last minute penalty securing the points. However, Friday's win for Motherwell over Kilmarnock confirmed St Mirren's relegation to the Scottish Championship. 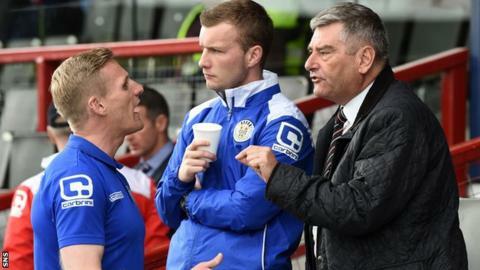 "Hopefully the board will come out and make a decision," Teale told BBC Scotland. "I love the club, I've been here for a long time. I took over in difficult circumstances and just fell short in terms of being able to keep the club in the league. "I certainly think with some of the players in there and players we've identified to come into the club we can go give a good account of ourselves next year. "It was always going to be a difficult ask. When you look at County and Motherwell and how they were able to go and invest at a crucial time of the season it speaks volumes. But I think I've done enough." Ross County dominated for much of the game, but could not build on Martin Woods' first-half penalty, which was cancelled out by Stephen Mallan's deflected shot before Thompson's late winner. "To come up and get a performance like we did today speaks volumes for the players in that dressing room," said Teale. "For the supporters who made the effort to come up here, you're looking for a performance and desire. We rode our luck, let's be honest, but we got the victory in the end. "The younger lads are in the team now for the last few remaining games to stake a claim for next season, so I'm delighted for them. Delighted for every one of the players." Ross County manager Jim McIntyre could scarcely believe his side came out on the losing side after creating the bulk of the chances. He said: "We put so much into the game, created so many fantastic opportunities, but we didn't have our shooting boots on. "I thought we were going to take at least a point from the game. If we were guilty of anything it was maybe being a bit gung-ho at times, especially towards the end of the match. "I don't think there was anything wrong with the performance, we just didn't have that ruthless side of us today. The story of the game is we didn't put our chances away and that's how we've lost the match."